The network-ready Oki B730n printer is favoured by offices and workgroups for its quick print speed and good-quality output. It can allow up to 30 users and it can deliver 200,000 pages per month. Print resolution can go as high as 1,200 x 1,200 dpi. The Oki B730n mono laser printer is equipped with a 600 MHz processor and has a 128 MB standard memory that can be upgraded to 640 MB. The B-730n printer does not come equipped with a standard duplexer. 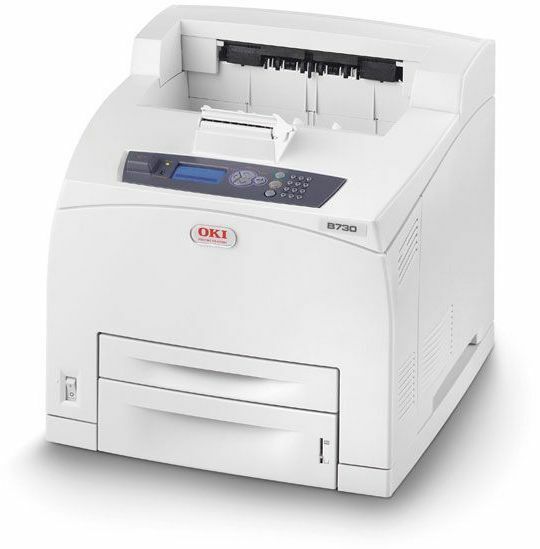 With a speed of 50 ppm, the impressive Oki B730n also comes with high paper handling capacity. The B730n has two standard paper trays that can handle 150 + 550 sheets. With optional trays, the total paper handling capacity is 1,800 sheets. The control panel comes with function buttons and a blue backlit LCD display. The Oki B730n mono printer weighs 21.1 kg and measures 404 x 422 x 465 mm. For connectivity, users will find USB, Ethernet, and parallel ports on the back. Printing from thumb drives is possible with the front panel USB port and control panel of the Oki B730n. Workgroups can easily sharp the Oki B730n networked printer as it has built-in Ethernet. It delivers crisp and professional output fast and yet it has low running costs. The Oki B730n LED printer is Blue Angel and Energy Star certified. This robust unit is compatible with PCL and PostScript printer languages. Office productivity can be increased with this machine thanks to its high capacity black Oki B730n laser printer cartridge. The addition of a standard duplexer for double-sided printing can make the Oki B-730n laser printer better for demanding work environments. This unit does not offer Wi-Fi connectivity.